April 8, 2019 — IPC - Association Connecting Electronics Industries®, in conjunction with INATRONICS 2019, held an IPC Hand Soldering Competition in Jakarta on April 4 - 6, 2019. The competition got “heated” as 38 competitors from 14 well-known electronics companies and one institute in Indonesia competed at IPC’s Hand Soldering Competition at INATRONICS 2019 in Jakarta, Indonesia. Taking first place with a cash prize of $300, winning a JBC soldering station was Indra Setiawan, PT.SIIX EMS INDONESIA, and the IPC Hand Soldering Indonesia Championship title. As the winner, Indra Setiawan qualified for the IPC Hand Soldering World Championship in Munich, Germany on 12-15 November 2019. Second place and a cash prize of $200 this year went to Ade Irma Suryani, PT OSI Electronics. Hisyam Ali Saputro, PT. Hartono Istana Teknologi (Polytron), took third place and a cash prize of $100. Participants in the hand soldering competition were tasked with building a functional electronics assembly within a 50-minute time limit. A panel of independent judges evaluated each assembly based on workmanship, overall functionality, compliance with IPC-A-610G Class 3 criteria and speed of completion. 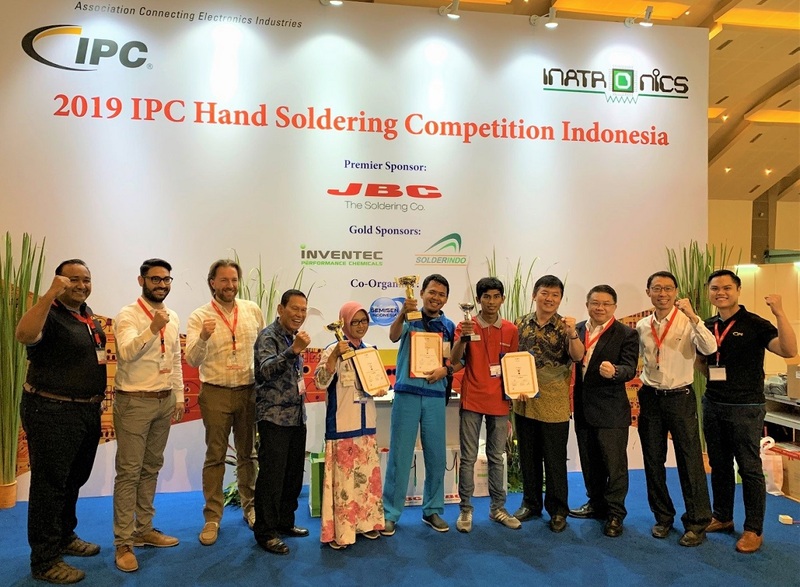 IPC specially thanks hand soldering Premier Sponsor — JBC Soldering Tools; Gold Sponsors — INVENTEC Performance Chemicals and SOLDERINDO; Co-Organizer — GEM Indonesia, for their support of the IPC Hand Soldering Competition Indonesia 2019. IPC is holding the IPC Hand Soldering Regional Competitions across Southeast Asia. Watch for announcements from IPC with locations and times. For more information on IPC events visit: http://www.ipcseasia.org/hsc.html.